The student may have exposed others on campus from September 6 to September 14. A student at California State University San Marcos has been diagnosed with the Mumps virus and may have exposed others on campus. The San Diego County Health and Human Services Agency (HHSA) said Wednesday that the possible exposure occurred on campus, particularly in Science Hall, Science Hall 2 and Markstein Hall, from September 6 to September 14 between 9 a.m. and 4 p.m. The student lived off campus and was current on mumps vaccinations. According to the San Diego County Communications Office, the viral disease was discovered through blood tests submitted by the patient to the county this week. This case is not related to the possible exposure incident a concert at the Casbah downtown on August 28. A San Diego resident diagnosed with the mumps recently attended a concert at The Casbah near Little Italy and health officials say he may have infected others at the concert. NBC 7’s Dave Summers reports. Mumps is a highly contagious viral disease that can be spread by coughing, sneezing or close contact. Side effects include fever, headache, earache, and inflammation of the salivary glands which can cause swelling in the jaw. People exposed to the disease may not start seeing symptoms until 12 to 15 days after initial exposure. There have been 1,897 cases of mumps reported across the country this year, according to the Centers for Disease Control and Prevention, which is the most since 2010. According to the Communications Office, a small outbreak of the virus was reported at the University of San Diego in March and April of 2016. Thirteen people were infected. The outbreak was controlled by a mass vaccination campaign. There is no treatment for mumps, and severe complications including meningitis, decreased fertility, permanent hearing loss and fetal loss are possible but rare. 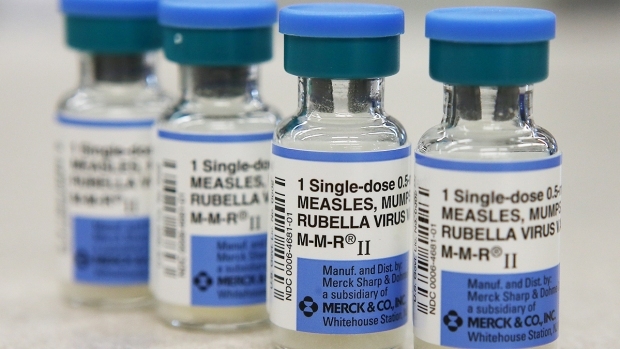 Two doses of the MMR (mumps, measles and rubella) vaccine are usually given at 12 to 15 months of age and at 4 to 6 years of age. A third booster is recommended for people living close to an outbreak. The University of San Diego (USD) is offering free vaccines to students after a mumps outbreak on campus. NBC 7’s Liz Bryant reports. For more information on the disease, visit the County HHSA Immunization website here.